Earlier this year, Jacob Douwe Egberts (JDE) in Bremen, Germany - the birthplace of the business more than 120 years ago - turned its back on the workers who've built the business and unilaterally terminated its agreement with their union NGG. A unilateral termination of a collective bargaining agreement is a violation of collective bargaining rights and of the OECD Guidelines on Multinational Enterprises. JDE's parent company JAB Holding also owns many well-known café chains such as Krispy Kreme, Pret a Manger, Peet's Coffee, Caribou, Einstein Noah, and Stumptown. 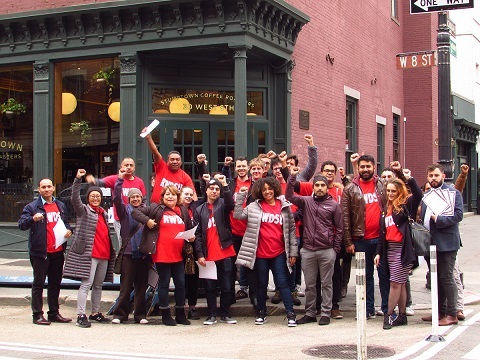 In a demonstration of solidarity and support for JDE workers in Germany, fellow IUF affiliates UNITE HERE and RWDSU/UFCW leafletted Stumptown cafes in New York City on October 9 telling customers that JAB Holding/JDE has to respect rights and negotiate with the NGG now.